When done right, alternate history stories can be a lot of fun, placing interesting twists on the past and present in order to develop creative worlds all their own. Fueled by potent imagination and a whole lot of burning coal, 'April and the Extraordinary World' does just that, thrusting audiences into a uchronian animated adventure full of colorful characters and retro-futuristic designs. Though some of the film's storytelling can be a tad clunky, the ideas present are always bursting with creativity… and steam. 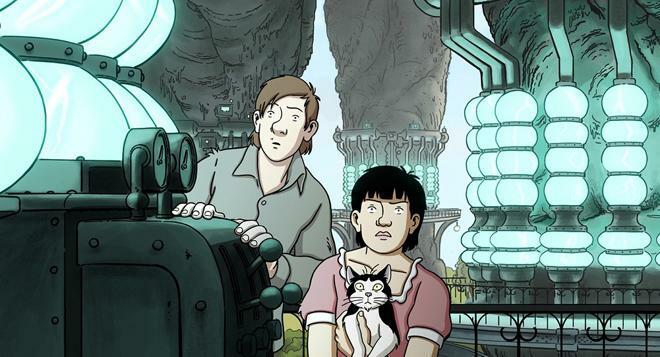 Inspired by the works of French comic artist Jacques Tardi, the animated tale takes place in an alternate history 1941 where electricity was never invented. Instead, steam and coal power have dominated the world. After her scientist parents are mysteriously abducted, April is propelled into a dangerous conspiracy tied to a potential "Ultimate Formula" that could unlock the secret to immortality. With the help of her trusty talking cat, Darwin, April attempts to track down her parents and keep the formula from entering the wrong hands. Tasked with setting up its rather complicated history, the film opens with a few prologue scenes that, while ultimately necessary, feel quite rushed and overstuffed. This makes the script come across as a bit convoluted during the first act, packing the narrative with preliminary plot elements, clunky expository dialogue, underdeveloped satire, and skimmed over alternate history bullet points before finally settling in with the main storyline. To this end, I was simultaneously overwhelmed by this hurried pace and underwhelmed by the resulting setup. Thankfully, once all this preamble is out of the way, the movie does find an engaging groove in its second half, investing us in April's journey to find her parents. With that said, April's character isn't always particularly memorable or distinct, making her come across as a pretty generic protagonist. Likewise, the same can be said about her standard friendly thief love interest, Julius. On the other hand, April's grandfather, Pops, and her talking cat, Darwin, inject the runtime with some much needed fun, and the story's ultimate villains actually prove to be the film's most interesting and entertaining elements. With that in mind, their appearance in the third act ushers in an exciting finale with a few solid twists and turns, using the movie's coal powered alternate history to offer a light environmentalist message. This industry versus nature theme is enhanced by the film's unique steampunk aesthetic, filling the frame with inventive retro-futuristic vehicles and architecture all cast under an oppressive cloud of pollution -- with nary a tree in sight. Based on the distinct art style of Jacques Tardi, the animation is a mixture of relatively simple yet still expressive character designs and more complex background details rooted in real-world locations. Using potent flourishes of color, the filmmakers punch up the narrative's otherwise drab settings, creating a genuine sense of burgeoning vitality beneath the smog. Sure, some movements can come across as a little stiff here and there, but the hand-drawn computer animation is quite lovely overall. Capped off by a surprisingly affecting coda tinged with bittersweet sentimentality, 'April and the Extraordinary World' overcomes some early stumbles to evolve into a rather inventive and entertaining steampunk adventure. Though the movie might not ever fully earn the "extraordinary" in its title, April's animated world is still well worth the trip. Universal presents 'April and the Extraordinary World' on a BD-50 Blu-ray disc housed in a keepcase with a cardboard slipcover. A DVD and instructions for an iTunes/UltraViolet Digital Copy are included as well. After some skippable trailers, the disc transitions to a standard menu. The movie is provided with a 1080p/AVC MPEG-4 transfer in the 1.85:1 aspect ratio. With the exception of some very minor artifacts, the image looks great, preserving the film's wonderful animation style. Outside of some sporadic banding during a few fading transitions, the digital source is clean and crisp. Clarity is great, highlighting all the tiny intricacies and extra bits of personality hidden within the hand-drawn computer animation. Though character designs are relatively simple, the world's steampunk aesthetic is nicely detailed, leading to some great designs for vehicles and architecture, placing a unique alternate history spin on actual French locations and buildings with surprising texture. Effectively reinforcing the dreary, polluted atmosphere of the story, the film's colors do veer toward a rather drab, gray palette in many scenes, though splashes of vibrant primaries like reds and blues pop from the screen with gorgeous saturation. Likewise, the movie's third act places the characters in a new, much more colorful setting, lending some variety to the image. Contrast is balanced well with pleasing whites and deep blacks. 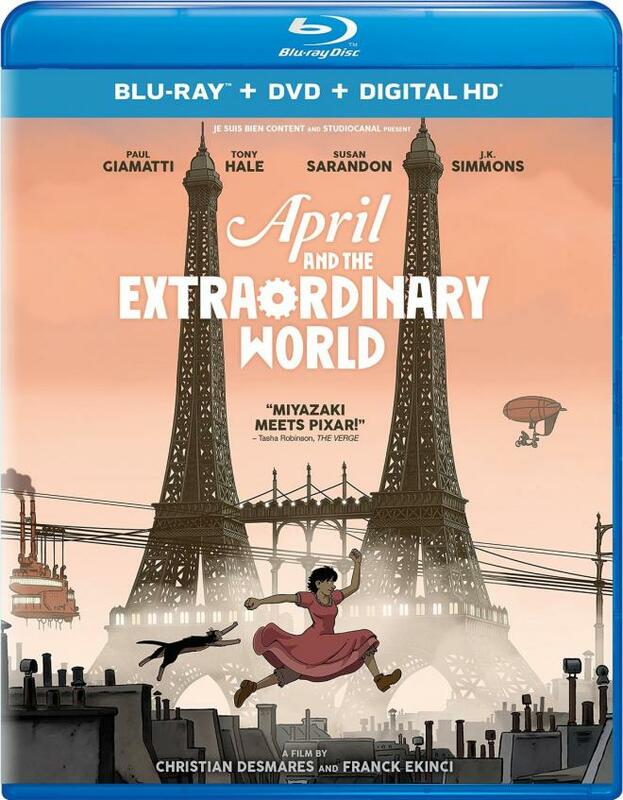 Wonderfully animated, 'April and the Extraordinary World' looks quite lovely on Blu-ray. Though there is some minor banding and the visual style is a tad drab at times, the video transfer is still home to some truly standout sequences. The film is presented with an English DTS-HD MA 5.1 track and a French DTS 5.1 track, along with optional English, English SDH, and French subtitles. Though it's disappointing that the original French language track is only presented as a lossy mix, the lossless English dub is handled very well. Speech is full-bodied and well prioritized throughout with no balance issues or other technical quirks. Though not quite as lively as some other animated tracks I've heard recently, the soundscape offers fitting ambiance for specific locations -- like bubbling chemicals in a lab or traffic on the streets of France -- helping to bring the story's steampunk world to life. Likewise, effects feature appropriate directionality and smooth imaging, moving vehicles (like a plane panning from the rear to front) and characters around the room when called for. A few sporadic explosions, and the movie's climactic action scene filled with laser blasts, carry some decent LFE, though bass is never on par with live action Hollywood efforts. While atmosphere isn't always as textured as it could be, and a lossless French track would have been a nice inclusion, as it stands, this remains a strong English dub. The Origin of the Extraordinary World (HD, 28 min) – Presented in 1080p with Dolby Digital 2.0 audio and English subtitles, this is a making of doc about the movie's production. 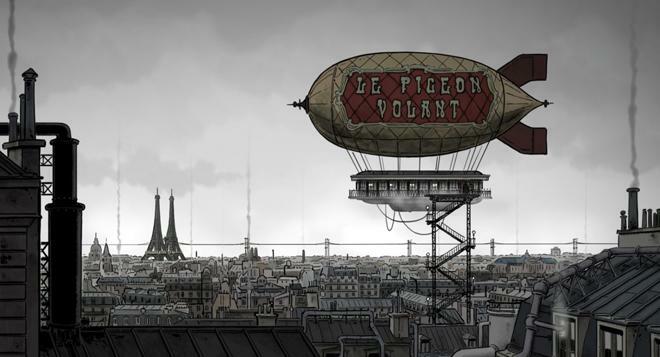 The filmmakers discuss the origins of the story and influences from Jacques Tardi's graphic novels. Likewise, the participants detail how they created the film's alternate history world with insights into the animation process, voice recording, and sound design. 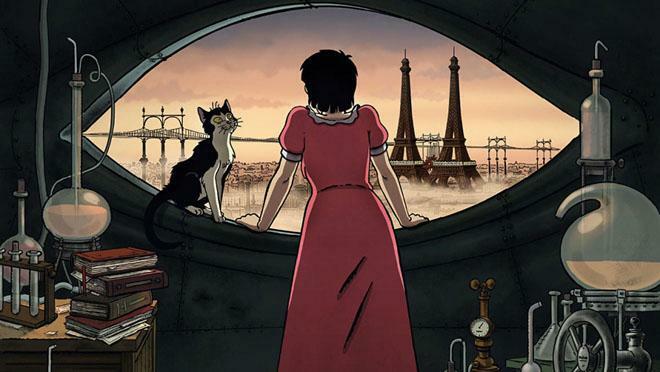 'April and the Extraordinary World' is a solid animated steampunk adventure. Some early storytelling elements are a bit clunky, but the film ultimately finds a fun and creative voice. On the technical front, this disc comes with a strong video and audio presentation, helping to bring the movie's distinct style to life. Sadly, we only get one behind-the-scenes supplement, but the featurette offers some decent insights. Though the runtime isn't quite as engaging or memorable as some other contemporary animated efforts, this is still a worthwhile flick.